Last night, I decided to clean up my Curbside Classic files and move some work into the “Complete” folder, the result being this 1968 Ford Pickup CC. Looking at this truck—which I shot down by the San Pedro Harbor during a Catalina sailboat restoration project—makes me realize that I should have posted it sooner. While it’s not totally original, the owner modified very little on the truck, the result being a rig that’s still close to the factory look. I’m sure there’s lots of folk out there who would like to take this short bed, two wheel drive pickup and bolt on nineteen inch wheels, install an airbag suspension and finish the look with dropped spindles that “slam” the truck down on the ground. Well, to each their own, but I much prefer this truck in its present guise. In our first shot, you may have noticed this truck lacks any side marker lights or reflectors. Because of that I thought it was probably a 1967. 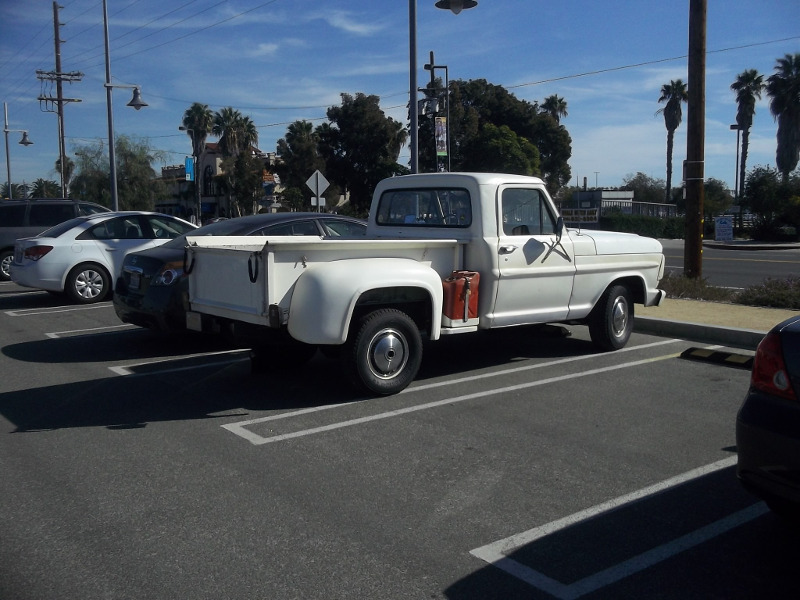 However, I discovered a very extensive ’67-’72 Ford pick up website and based on this information, it appears this model is actually a 1968 with the exterior badging and side lighting removed. It could be even newer, but Ford was nice enough to change the grille most years of the model run, and this is the base model grille for 1968 (higher trim levels used the same grille with a bright aluminum or chrome finish). The interior also uses a number of 1968 (or newer) parts. 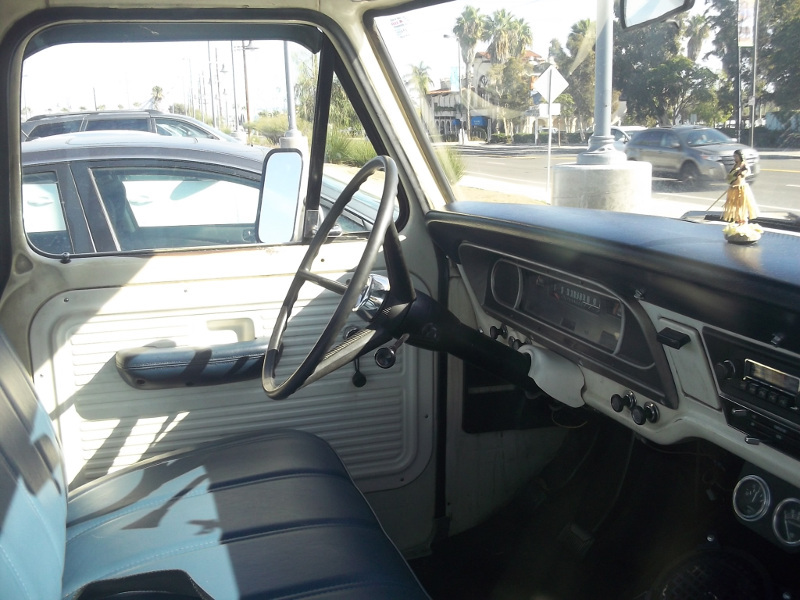 Ford made a surprising number of changes to the 1968 cab; they went with new door release mechanisms, added lock buttons to the back of the window opening, and changed the HVAC controls from push-pull knobs to the panel you see below the radio. I also see a number of other features I like in this cab: the clutch pedal indicates we’re looking at a three-on-the-tree transmission, the radio appears to be stock, and the owner has added a couple of gauges to keep track of critical operating parameters. All in all, a vehicle office that passes on flash, but delivers the goods for day to day operation. Removing the exterior trim on a car leaves a nice clean look, but most people then feel compelled to gussy things up with a flashy paint job and custom wheels. This owner chose to accentuate the clean lines with bright white paint, and let the lines of the body do the talking. Placing a fuel can in front of the rear wheel lends a custom touch, but a pragmatic one. You could actually put fuel in that can, and use it to extend your travel range, or perhaps fuel some equipment. I get the feeling this owner is someone not worried about how others perceive his truck. Perhaps he came down to the waterfront to get in a little fishing, or perhaps he’s here on a service call. I’m pretty confident he knows what’s going on under the hood of this truck, and I’ll bet any changes made to the engine bay were to improve cooling or reliability, not to increase horsepower. Given that this is a base-level truck, it could quite likely be a 240 CID six. If the truck does have an upgraded engine, I’d expect it to be the 300 CID six, rather than one of the V-8 options. No real design surprises on the driver’s side of the truck, but what is that behind the rear wheel? Shooting on the shaded side masked the image, but the driver placed a tethered chock behind the wheel–you can see the tether running over the top of that bright white fender. Given the overall condition of this truck, I have to believe the parking brakes work just fine, and this chock just represents further proof of our owner’s meticulous nature. 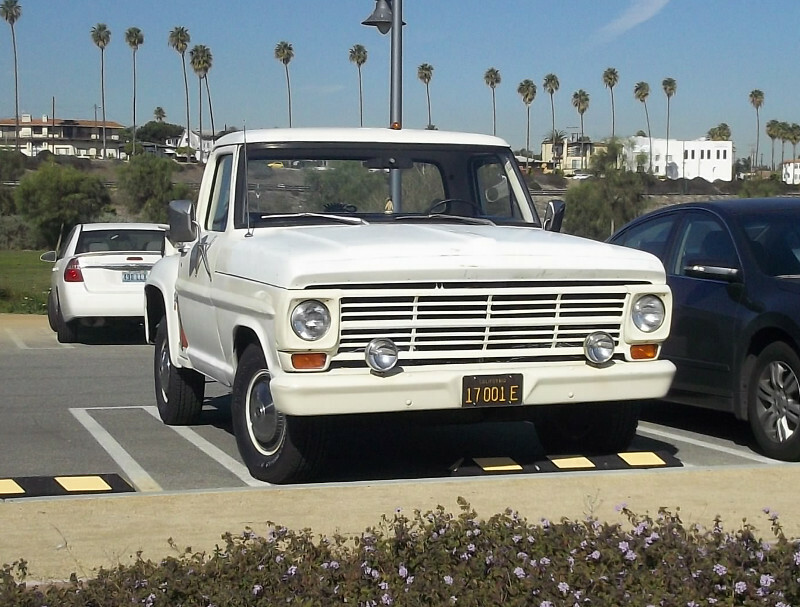 It’s not that I’m in the throes of a man crush, but the owner of this 46-year-old truck really seems like a cool guy! We all know people who feel a new vehicle every four or five years represents the best way to assure reliability, but our truck owner pursues a different path. As we’ve discussed before, American pickups have also pursued a different path since Ford built this pick up back in 1968. Today’s truck emphasizes play over work, offering suburban owners a tool to transport their boats, bikes and personal watercraft out to rural playgrounds. 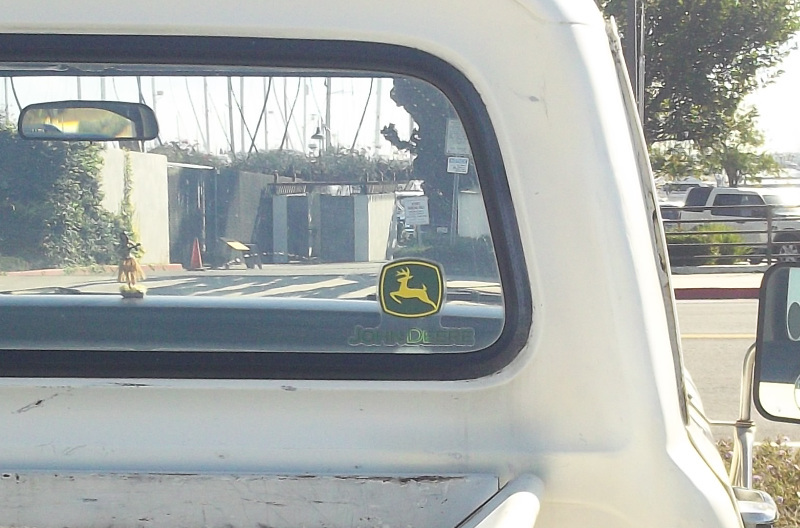 In contrast, this truck harks back to a simpler time, as evidenced by this John Deere sticker in the back window. Every aspect of this ride brings to mind the attributes of a basic work truck. Attributes such as: clean, pure, direct, simple and honest. Bottom line, it’s a truck you’d be proud to own. 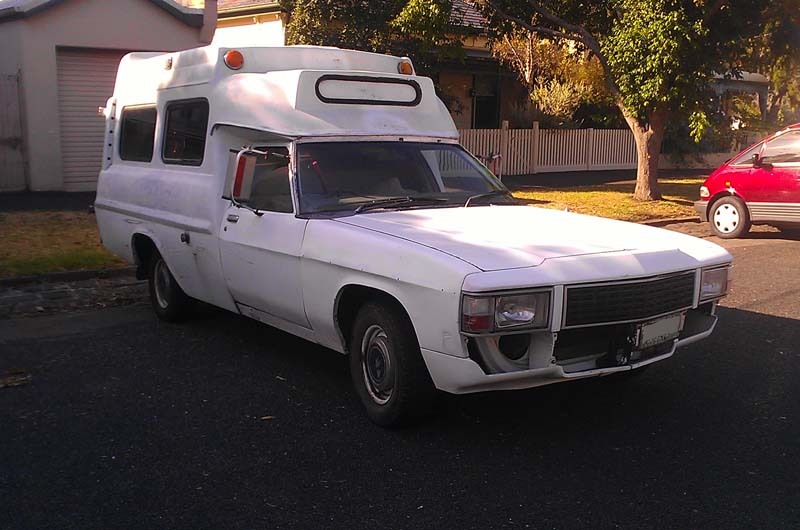 In Aussie these got converted to Ambulances the rear cab panel was removed and a fibreglass 3 door body installed once Ambo duty was over they got sold to the general public, I looked at buying one once a 68 with 240 6 and 4speed box the deal didnt go thru for various reasons one of which it was incredibly slow mostly because with the ambo body it weighed some 2 and a half tons I wanted a camper van for travelling, I ended up with VW Kombi which wasnt any faster didnt last very well but did use a lot less fuel when it was going, wrong choice no doubt hindsight is always 20/20. Here’s one on a camouflaged HQ. The lines don’t quite match. That HQ has a WB front end.And a HJ bench seat. It’s aHQ alright though,you can tell by the little fillets in the top front corner of the doors. Very much a mixture of years here. I took a guess. I’ve only ever seen these ambo backs on the HQ. Thanks for the pointers. 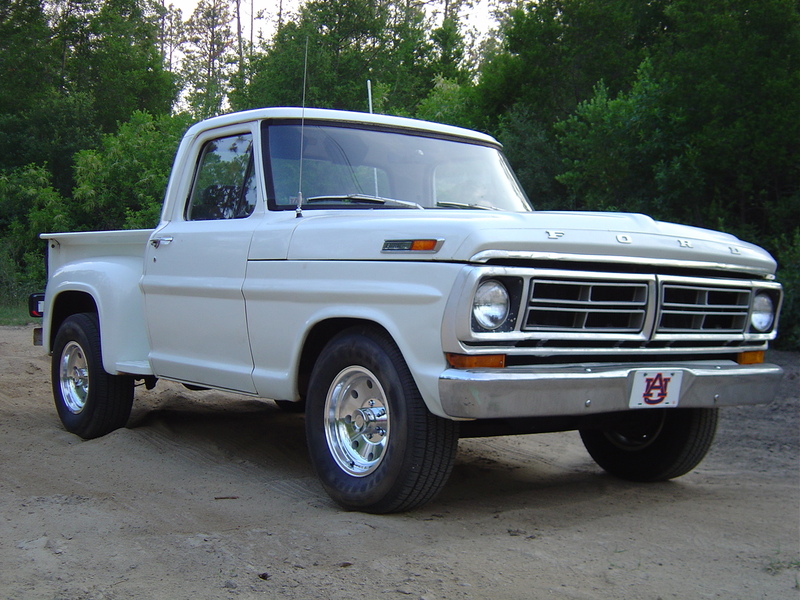 I saw one of these recently the pics are in a dead hard drive but it turned out to be a 72 Ranger pickup but to me it was a 68 F100, who can enlighten me on that one? The same body style was used from 1967 to 1972. Until 1982, “Ranger” (or more often “Ranger XLT”) was a trim level, usually the top-of-the-line, on the F-Series pickups. So the full model name was probably “1972 Ford F-100 Ranger XLT”. In the late ’70s one could buy an F100 XLT Explorer Ranger. Yikes. True dat it had all the XLT trimware I didnt notice F100 on it anywhere must vacuum that harddrive. I like the way you “read” the truck. It’s a great example of how form, even form strictly determined by function, always carries expression and therefore meaning. So you could look at this Plain Jane pickup as a piece of minimalist art and read it accordingly: all non-essential elements have been stripped away and everything that is present has a clear purpose. 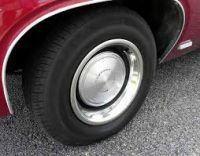 Even the 70s hubcaps are cleaner than the dog pans that would have come on the truck. While I understand the desire to highlight the clean lines and respect the lack of flash, I do miss the model badge/marker light combos that usually live on the hood sides. Nice-looking pieces of trim. Very good, honest looking truck overall lthough! I like them with some shiny bits, too. My ’68 Camper Special has the Custom Cab (mid level) trim but I would rather have the Ranger trim. I prefer the forth generation (61-66) trucks for their more contoured form but I also really like the forward-swept design of the fifth generation Ford trucks – also seen on the third generation Galaxies. To my eye, these car hubcaps are frump-tastic. I don’t dig wheelcovers about 98% of the time, but the ‘flat top’ dog dish’s with 3 ‘ford’ logos going around in combo with the deep trim rings looks clean and smooth, yet gives a bit of attitude. Personally, Id use them on 8″ wide steelies up front, 10 inchers out back. My obsession with pickups and utes is just growing. Prefer the fleetside (styleside? which one is Ford?) but this is a really nice find, Dave. Styleside is Ford’s term for the straight-sided bed introduced in 1957. Flareside is this truck’s bed. Chevy’s terms were Fleetside and Stepside (although newer fiberglass models were often called Sportside), and GMC was Wideside and Fenderside. Dodge called their beds Sweptline (not to be confused with Sweptside, which was the special model with a bed made from the contemporary Dodge station wagon) and Utiline. Jeep originally called the beds on their Gladiator Townside and Thriftside, which accurately reflected the fact that the average urban truck buyer in the early 60’s cared about appearance, while a more rural buyer might only care about saving money. And the Thriftside had absolutely no adornment whatsoever–straight bed sides, straight fenders. In the 70’s the J-10 was available with a flashier Sportside bed. IH called their straight-sided beds Bonus-Load, but never had a special name for the narrow beds other than “standard”. A J-10 with the stepside (SportSide) bed is one of my holy grail trucks! Came close to nabbing a bright red ’81 in highschool as my first ride…but too much $$ and the tinworm had taken up residence. Well with an air bag suspension this truck could be made to ride smoother, but there are still probably tradeoffs if that was done. Lovely looking truck which I assume is an F-100 and I love the shade of off white which reminds me of 1980s Saab’s. The mint black plates are a great to see as well. That Jerry Can looks a bit vulnerable though to people with sticky fingers. When in San Francisco last year my folks and I were the only people using wheel chocks on their 21st Century vehicle even though we had also turned the wheels and applied the lack luster parking brake. Yep, it’s an F-100. The fact that the bed is a short 6.5′ instead of the long 8′ confirms it. 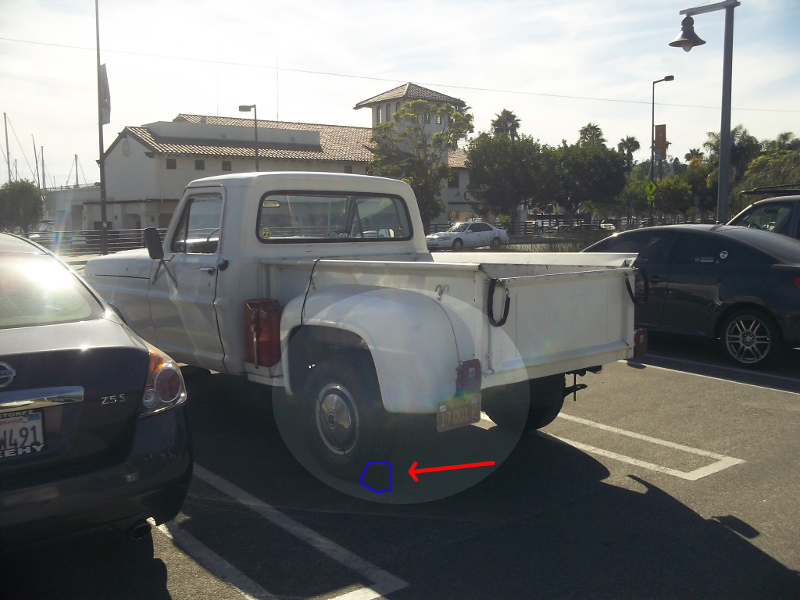 Were it an 8′ Flareside, we’d have to see a badge or a bolt pattern to distinguish between the F-100 and F-250. This was the last generation on which a 9′ Flareside was also available on the F-350. Those wheel covers are also a nice touch. I don’t believe that cover was made before ’71, but it was part of the late history of this body, and carried on through much of the ’70s. A simple clean look that matches the rest of the truck. I am a fan of the old Ford Flareside trucks. I became a more than casual observer after buying my 63 F-100 Flareside. The bed on these seemed to go straight back to 1953 with little or no change. 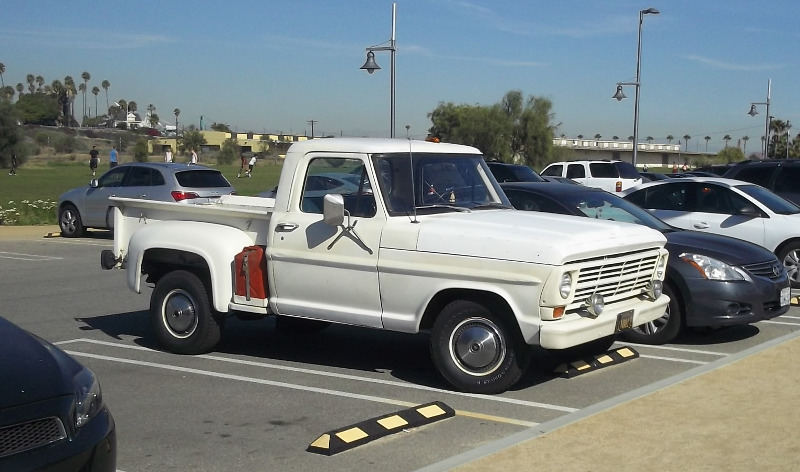 At some point in the 70s, Ford flattened the upper edge of the box in order to better accommodate a cap, but that seems to have been about the only change until they updated the Flareside for the 1980 restyle. I believe that they remained wooden floors during the entire run (through 1979), but I have no firsthand experience with the newer ones. This truck still wears the older style with the angled edges on the upper sides. I’ve read that the location of the fenders, height wise, did change over the years but don’t know how much it changed or exactly when. AFAIK, the new-for-67 models had a slightly taller bedside, but I can’t confirm. The ’73s were the first with flat tops, and from 73-76 Ford didn’t make a short Flareside, only a long Flareside as a bottom-of-the-bin special. In ’77 the shorties returned, mostly on Free Wheelin’ and other “lifestyle” trucks, and ’79 was Ford’s last year for an 8′ Flareside. I didn’t know that the new ’80 Flareside had the same bedsides as older ones. If it ain’t broke, I guess. The traditional wood-floored, steel-sided Flareside left after only one year on the new ’87 body style. Production numbers on ’87 Flaresides are hard to find because Ford just made them with the old bed and new round-wheel-arch sides until they ran out of beds. When the Flareside returned in 1992, it was a modern steel bed with fiberglass sides based partially on the fiberglass dually fenders. Ford’s last Flaresides were in 2009, with the 2004-08 beds given new ’09 decals and badges in a move reminiscent of the ’87 Flaresides. The actual center box might have been the same but after about ’80, the fenders were more angular on their flareside. And the fact that Ford Flaresides go back to ’53 is nothing really special. Dodge’s Utiline was the same basic design from ’53 (the last year of their B-Series trucks) to 1985, and IH utilized the same “standard” bed from 1957 to the end of their light truck sales. GM likewise used the same tailgates and bed sides from 1955-87 apart from the industrywide shift from angled to flat tops, but at least sprang for new fenders with each complete redesign. With the dual extra gas cans, yet street tires and full wheel covers, it’d be interesting to know how this truck is used. It’s also noteworthy that there’s no dual exhaust or rear trailer hitch. Not to mention the possibility of fuel theft from those cans. Of course, as mentioned, maybe the fuel cans are for another purpose, entirely. Regardless, it’s a nice, honest truck, for whatever purpose it’s ultimately used. Given the 240/300’s reputation as some of the most reliable engines ever built, I’m trying to imagine what kind of changes those might be. My 240 has never overheated either. I’d pull the points distributor and drop in an electronic unit off a later Ford 6. You could also upgrade to silicon cooling hoses. Beyond that, nothing much comes to mind. Silicon cooling hoses…now why didn’t I think of that? 🙂 My rubber ones are at least a dozen years old, and feel pretty good yet. The electronic ignition is a mixed bag, reliability wise. If it dies, you’re stuck. Points don’t really die suddenly; they let you know if they’re getting funky, and one can always clean them up a bit to get some more life out of them. I’d say the advantage of electronic ignition is better running/idling on cold/wet days, but I’m not convinced it would necessarily be more reliable. 300 was available in D series cabovers as an alternative to a diesel never heard of any problems with em and putting one in a 14tonne GVM truck is a good test. The John Deere sticker is contemporary-period correct would have the deer landing and the typeface a simple helvetica-but it is good to see the green and gold representing. Reinforces the impression that this is a real working truck. Maybe we can have our friends at Gathering of the Green send him the proper one. This is a solid truck in every sense; I saw many of these in their time and much after. The one that laid the foundation for Ford to overtake Chevy and maintain the lead in the truck wars. Green and gold?! You of all people should know that it’s green and yellow. But a more period-correct JD truck would have been Chevy or GMC. So long as Ford was making tractors, very few Deere dealers would buy one of “their” pickups as a parts truck. Uh, yeah. Class of ’74, but I hate to count that far. Got me on the green and gold, I must have been mixing my two favorite sets of colors-green and yellow indeed. 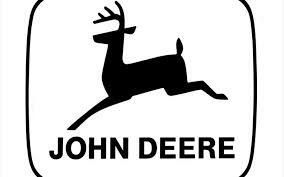 With Drzhivago’s logo on the 60, 3010 and 4020, and the one I posted on the 4430, I have spent many an hour gazing at the leaping deer while rolling down a field of corn or soybeans. I did check with the John Deere website for accuracy before my post, but it’s all good. Where we come from there weren’t very many Ford Tractor dealers left-after the 8N and the Jubilee, Ford didn’t keep up with the tractor horsepower wars very well and suffered accordingly. So a Ford truck on a JD farm would have been acceptable. But an International pickup, that’s a whole ‘nother deal; the kind of mixed marriage your Grandpa and Dad would warn you against. Looks very well maintained, like the owner is someone who repairs things for a living. I would think for boats but those guys can probably park closer to the marina than that. It’s a very cool looking old truck. The ’68 Ford was the same truck in the obscure Charles Bronson movie Mr. Majestyk. A great movie and one that probably cemented the “Built Ford Tough” image in a lot of people’s minds. Either seeing the actual movie or all the commercials that featured that clip. You had me until you showed the sticker on the rear window, pretty much marks it as a poser’s vehicle. 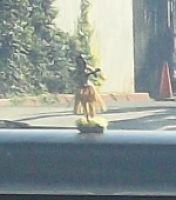 As does the plastic hula dancer doll on the dash. Hipster Alert!! The wheel chock on a level parking lot suggest to me that the owner is youngish, bought this truck fairly recently because it’s “cool”, and doesn’t properly understand how it works. It is not going to roll away by itself if it’s in gear and the brake is set. Or even just one of those. Nothing wrong with that per se, but wheel chocks on a flat parking lot?!? I just can’t see a long-time Ford truck owner doing that. Say what you will about the owner’s habits, but I’d rather he (or she) drive it because it’s “quirky” and deserves a second life than have it rust away in a Midwestern farm grove, or get jacked up on 35’s by some good ol’ boy to go muddin with, and beat to death. Glad you (sort of) referenced fordification.com as there is no better source of info. 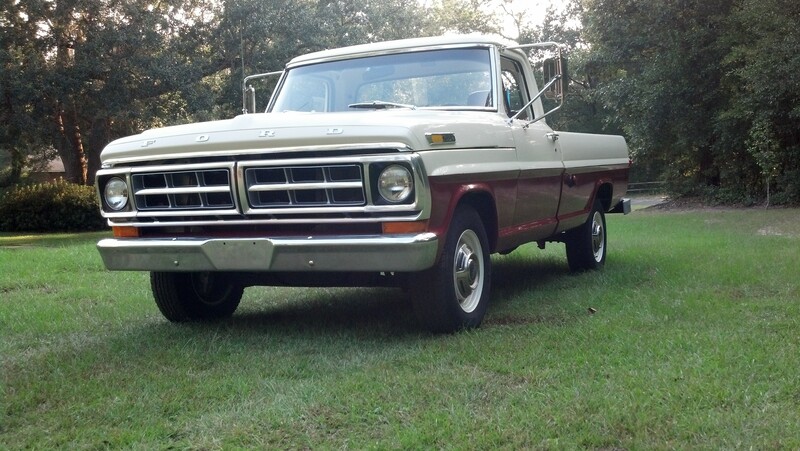 I have two of this body style… a 72 F100 Flareside and a 71 F250 Camper Special. These are great old trucks that are complex enough to do just about what ever you want but simple enough to maintain with relative ease! Wow, absolutely love the F-250. My Grandma had one of those on her farm when I was growing up, it had a FE big block (dad thinks it was a 390) with a manual on the floor. Not a camper special – hers was a base model – but I always wanted that truck, bad. 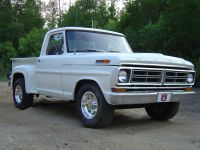 In a perfect world I’ll have a ’68-72 F-250 with a FE and stick, and another ’92-96 F-150 XL or Custom with a 300 and a stick. Oh and I’ll keep my ’99. I’ve got a bit of a “thing” for Ford trucks. Fordification is a Great site, but I was disappointed that they only covered 5 years of pickups. Given the name, I’d expect coverage for all models and all years. I had a 73 F100 that I bought with side mount boxes instead of a normal bed. 289 up front so not original but it ran sweet. Pretty theft proof because I had a floor shift installed that neither I nor the mechanic could figure out. It shifted backwards with reverse on the lower right and 3rd on upper left. When my son grew up and moved out he left it behind needing fixing. I wound up selling it and hated to see it go but kept the 79 Datsun King Cab instead because of the 100 mile commute. It seems to have been my last Ford, IIRC. Same problem my ’72 F100 had when the column shifter broke. Replaced it with a Sparkomatic (!) shifetr kit from Forest City Auto Parts… a long-gone n.e. Ohio chain. You probably needed to flip the reverse-third arm on the transmission (the one attached to the shaft extending out of the transmission case). A buddy of mine did that to both arms on a Ford Bronco (by mistake), and it flipped both throws of the pattern. I’m always hoping to find an old Ford like this. Especially a Southwestern sunburt one, with the right patina and Navajo blanket on the bench and I 6 w / granny. I saw many still working hard in West Texas. For some reason the GMC/Chevy flare sides of this era are much more expensive, and usually overrestored or customized. Maybe it’s the Camero look. I prefer Ford, it looks like a worker. This truck just screams ‘western ranch rig’…its the gerrycans that peg it. Put my name under the ‘rabid stepside fan’ column every time. And for my money, ‘real’ stepsides have chains and hooks, and wooden slat flooring not this flareside or sportside garbage that Chevy started in ’88. The thing that really grabs me is what a blank slate this truck truly is. Granted, it has its fans as is. I see a set of slot mags with mildly aggressive truck tires, a push bar and a respray in some period correct earth tone paint….keeping the white grille and roof though. Nice find! Clean and functional older trucks like this are one of the best things about the west coast. The Fords of that vintage are my favorite trucks. I’ll take it…though I might ditch the three on the tree for a 4-speed stick. It’s pretty unusual to see a flareside bed on a 1960’s F-series out here, they all seem to have either a styleside or a flat tray (or a tow truck body!). Of course the early models are different, but consequently a flareside looks strange to me. Nice old truck. Personally, I don’t care for the look of the flareside on this body style. I think the Chevrolet and GMC’s stepside looks like the bed matches the cab better than the Ford. The radio looks like an aftermarket to me, but it is a period piece. A factory radio would have knobs that match the others on the dash. In fact, it looks like a zero option truck. The gauge cluster is the somewhat unusual idiot light version. Most of them had the optional full gauge package. I do see a cigarette lighter, but that could have easily been added later. He had to pay top Dollar on it , $800 IIRC , runs sweetly , I used to keep it tuned up sharp for him . Any sort of electronic ignition is better because of the improved running , fuel economy , reduced wear on starter , ring gear , battery and so on due to *instant* starting hot , cold or who knows what . if properly installed , electronic ignitions don’t fail ~ I run them in all my oldies and have _never_ had one fail yet but them I follow the directions , check to make sure the coil has the proper impedance and so on .